Paul was walking down a road of doom. It was clear that if he went up to Jerusalem, he will suffer greatly. Twice in chapter 21 his disciples and his followers and his friends urged him not to go to Jerusalem, for great is their revelation that Paul will suffer – through the Spirit they urged Paul not to go on to Jerusalem [Acts 21:4]; Agabus the prophet came down from Judea and very dramatically showed Paul and his companions what will happen to him if he go to Jerusalem – he will be bound, he won’t be a free man. 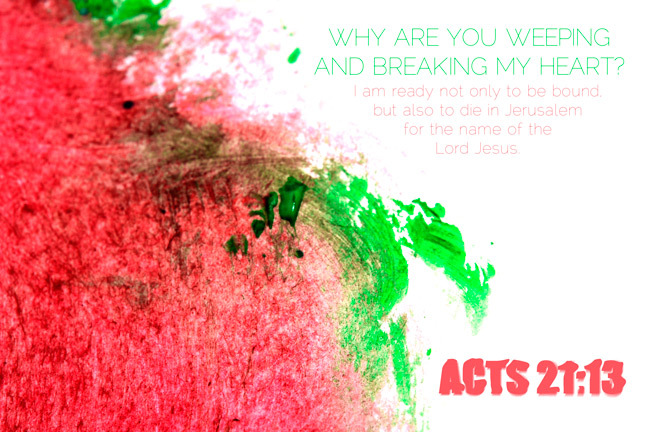 When we heard this, we and the people there pleaded with Paul not to go up to Jerusalem [Acts 21:12]. Yet Paul declared he was not only ready to be bound, but he was also ready to die for The Lord. In this study, we will examine the heart of Paul for his brothers and sisters, and the heart of Paul for Jesus. Why are you weeping and breaking my heart – you know sometimes you are ready to make a sacrifice, but your resolve weakens at the sight of your weeping family, who grieve for you because they know your plight ahead. Like a soldier who has steeled his heart to do his part for the country and go to war, but as family you grieve because you know that the likelihood of death is high. Even if he escapes death, he will be surrounded by death, and may end up with a permanent injury. Whatever resolve you had to leave behind everything and just go ahead will be weakened. Even if you do not waver, your heart will break because of the grief that you are causing your family. Paul feels for these people. He reciprocates the love and concern that they have for him in equal measure. If he could have gone ahead with his calling without hurting his beloved friends and disciples, surely he would have. I am ready not only to be bound, but also to die in Jerusalem– the revelation that his followers received was clear and consistent enough. Agabus revealed the extent of the revelation that he had received – that Paul would be bound. But just as the revelation had been clear to his companions, it was even clearer to Paul. He knew and was prepared of what he eventually had to do – martyrdom. He knew that eventually, going to Jerusalem will lead him down a path of mortal doom. And in Christ Jesus, it was a path to his kingdom’s glory. Such a situation does not evade us either. You may have experienced something like this, when all odds are against it, all signs show that it is a bad idea for a missionary to go to a certain war torn mission field, but he is unwavering in his decision to go. Your heart breaks because of the hardship and danger. And the missionary’s heart breaks because of your grief. for the name of the Lord Jesus – Have you ever loved anybody so strongly that you know that you were willing to die for him or her? It could be your family, it could be your partner. It could be a very good friend, or your benefactor. Somebody once told me that it was nothing to die for somebody. It would be something to kill for somebody – a very extreme example, a very twisted example, but I think the feelings of sacrificing for the sake of a person – in terms of killing, not just the sacrifice of your life and your future, but also the sacrifice of your righteousness and morality – is consistent here. Some of us may be willing to die for our loved ones. Some of us may even be willing to kill for our loved ones – and I do not in any way advocate or agree with it. Some of us, like me, may not be willing to die for anybody at all. Paul’s focus was clear – it was for the name of the Lord Jesus that he willingly and readily allows himself to enter the plight of being bounded and martyred. Not for any man. Not for a lover. Not for his family. But for the Lord. As much as he cared for his brothers and sisters in Christ, his focus was always on the Lord. While it grieved him to hurt them by his persistence in going to Jerusalem, because his focus was on the Lord, he was able to go ahead with it. Sometimes, we will break hearts. Sometimes, our own hearts will break. Despite that, are you still able to keep your focus on the Lord? Paul was an outstanding and extraordinary man and apostle. His life ended in martyrdom, but even as he neared his death he found great peace in The Lord. He loved the people, very much so that his heart broke when he saw that they were weeping for him. But his love for God was greater and he was resolved to follow God’s will, even if it resulted in his death.